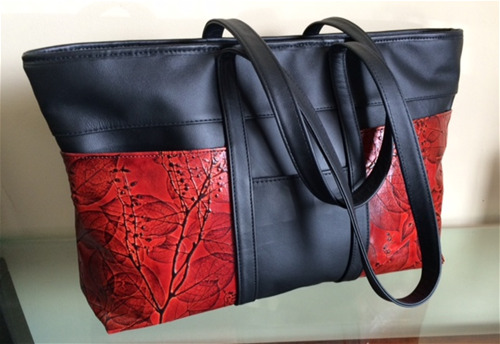 Leaf inspired handcrafted tools are used to create exquisitely raised leaf patterns, combined with the finest black garment leather, these all leatherlined handbags and accessories are both beautiful to the eye and pleasing to the touch. 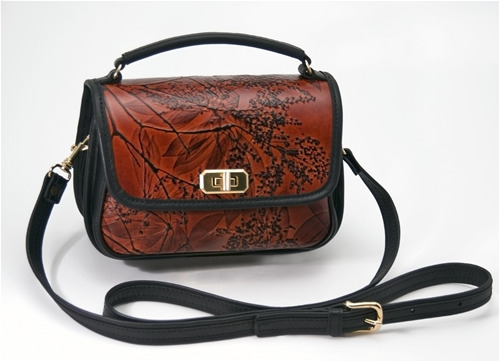 Visually stunning but practical too, many of the bags are multifunctional, going from day to night easily & in style. A place to put everything! This bag features 4 outside pockets. 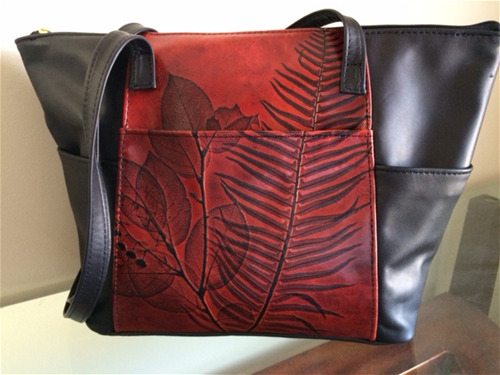 The two center pockets front & back feature the Leaf design and there are two black leather pockets on either side. It has a zipper closure, with an interior zipper and cell phone pockets, two over the shoulder straps, all done in soft drummed garment leather. Leaf design on front flap with, a twist closure, below it a spacious three-quarter-height front gusseted pouch, large enough for a phone. Back outside black leather pocket, also large enough for a phone. 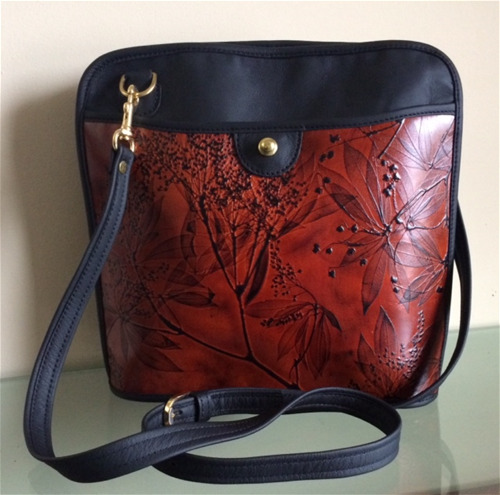 Handtooled Leaf design is featured on the front outside magnetic snap pocket, on the outside back a zippered black leather pocket and the new feature - an adjustable cross body strap. 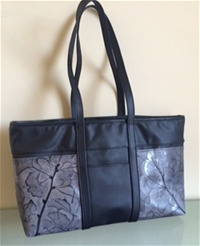 It has a flat bottom for sitting upright, a double-pull zippered closure, opens the bag on 3 sides, with side gussets that keep contents in place. Inside there is an extra large inside divider pocket along the back wall, adequate for personal electronics PDA, DVD player or notebook. Roomy center, with, inside pen and card holders. There are 3 outside front pockets, the one on the front center is black leather, the two on the sides, features the Leaf design. There are two black leather in the back , on either side, with a Leaf designed panel down the center. It has a zipper closure, 2 over the shoulder straps, with an interior zipper pocket, a cell phone pocket and card & pen pockets. Very roomy main body compartment.